What is Copper Nickel Plate ? Aakash Steel is a full line manufacturer and supplier of Copper Nickel Plate We can supply cut to size Copper Nickel Plate with both narrow and wide widths. Copper Nickel Plate have excellent quality to fully satisfy customer’s requirements. An ISO 9001:2008 Certified Company, Aakash Steel is a leading stockholder, supplier and exporter of Copper Nickel Plate . Copper Nickel Plate are cut to your specifications and supplied with complete set of mill test reports. Custom length and width can be made available. Exports is Our Specialty! and we can source many hard to find grades and or non-standards sizes to meet the special requirements of our customers. All Copper Nickel Plate can be cut to size with the help of our extensive expertise in processing steel plate products. Orders at Aakash Steel are guaranteed fast delivery of the Copper Nickel Plate in the country. The main reason being we have an excellent warehousing and storage facilities for both finished and semi finished goods.They are made ready as per the urgent requirements of the customers. The Copper Nickel Plate are manufactured to sustain very high pressure and product warranty.In 2016 we have stocked 6 tons of Copper Nickel Plate in all sizes, to cater to immediate delivery and urgent needs of the clients. For small requirements we can dispatch the Copper Nickel Plate immediately against the purchase order. 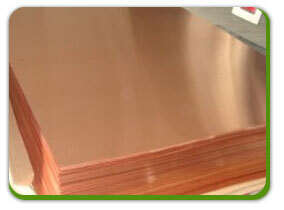 Copper Nickel 70/30 Plates, Cu-Ni 90/10 Sheets, Copper Nickel Coils Manufacturer, Exporter & Suppliers in India. ASTM B151/171 UNS C71500 70/30 Plates, Cu-Ni UNS C70600 90/10 Sheets, Cu-Ni Coils, Shim Sheet Suppliers. We are among the Manufacturers, Exporters and Supplier of high quality Cu-Ni Plates, Sheets & Coils in mumbai, India. We also manufactured these products as per national & international quality standards. Copper nickel is known for its great resistance to seawater, as well as many other hazardous elements presented to metals. These are widely used in various application industry such as Cement industry, Power Industry, Petrochemicals Plants, Oil Refineries, Fertilizers Plants, Sugar Mills, Chemical Plants, Pharmaceuticals etc. These Copper Nickel Sheets & Plates in available different grades, specification & thickness as per the clients requirements. We also offer our clients for responsible price in the market. Copper nickel is known for its great resistance to seawater, as well as many other hazardous elements presented to metals. C706 and C715 are commonly used in seawater environments because of total resistance to barnacle growth, which is created by a thin tenacious protective film formation. Each order is packaged according to the customer’ s standards including preparation for export such as wooden case, pallet or according to customer’s requirement All shipping documentation is provided for Copper Nickel Plate delivery from mill to customer.